The Ann Arbor Area Disc Indueced Sports Club (A3DISC) runs and April Fool’s Day tournament around this time of year. Sunday there was a full field (limited to 144 players). I was one of the nine amateur woman playing the tournament; four Am I (highest level) and five of us in the Am 2 division. I came in first in the Am 2 division beating the next gal by 11 strokes. It was a lot of disc golf … 48 holes and a lot of throws. To see the official results go here: www.a3disc.org. Here’s me and my trophy. Also in my hand is the disc, art created by my friend Craig Prime, given to all the top place winners. The Advance Yoga Posse did backbends tonight. Slowly, we opened the chest, backbending over the chair using it for support and feedback. It’s a lovely counter action to the rounding of shoulders, a result of always having life in front of us. What I noticed tonight was the progress the posse has made. Backbends for adults do not come easy and just a few months ago pushing up into a backbend wasn’t easy or even possible. Tonight not only was it possible but it was possible repeatedly so. Sometimes our human nature tends to lean towards the negative. We don’t see how things change, even incrementally, because of our nature or our inability to be aware. Tonight not only did I see progress, but those doing the backbends recognized their progress. And that awareness and ability is itself progress. As part of the wellness initiative at work we ran a NutriCare class. The class is designed to meet the needs of people trying to lose weight, change their cholesterol or blood pressure, or just eat better. Glaringly, I wasn’t getting the recommended number of grams of fiber each day so I’ve beefed up (figuratively) on fiber. Today I calculated that I ate 32 grams of fiber, just over the 30 mark I was shooting for. One of the items that helped was this Kashi Salad. It’s tasty and fill of fiber so I thought I would share it. Cook until all liquid has bee absorbed, about 25 minutes. Spread Kashi on sheet pan and allow to cool. Add enough Kashi vinaigrette or your choice of dressing just to coat and toss well. Serve chilled. Makes eight 1/2 cup servings. Enjoy the 7 grams of fiber in each serving! My post the other day about Girl Scout cookies reminded me about my Camp Fire Girls vest. I found it, along with some beads, badges, and a charm I earned long ago. I shot them in my light tent this weekend. One of the badges is specifically for selling candy. Not sure what the other badges or beads were for. This week I was surprised to find the MySpace page of a young man I knew who died of his own hand on July of 2006. On the “In Memory of” My Space page, this guy (dead now over eight months) has a dozen friends, some of whom still leaving comments for him. In fact, he has over 50 comments. Ten of those comments have been left in the first two weeks of this month.Through a convoluted series of clicks I ended up on MySpace. How I got there and what I was originally looking for aren’t related. Isn’t that the way it is sometimes on the internet? You start heading in one direction and you end up in another direction … or at least you stop at places along the way that you didn’t think you would. That’s how I got to MySpace. I abhor MySpace. There are so many reasons I object to MySpace and I’ll just list a few. First and foremost is the gaudy, icky, horrible look of just about every single MySpace page I’ve visited. I think all the backgrounds are annoying. Either they are too dark to read what’s there, too bright it feels like sunglasses are necessary, or just plain distracting with all that flashing, darting, glimmering hearts, lines or whatever going on. Not to mention the page is too wide for the screen. I hate sites where I have to scroll left and right as well as up and down. I have to admit that the target audience for MySpace is about half my age. So, maybe I just don’t get it. To me it seems the “communication” going on between MySpace friends is inane, profane, and out of line. I feel a “kids these days” coming on so I’d better stop before I propel myself into an even older demographic group than I belong. This is still quite curious to me. How can dead people have a MySpace page … or any web page for that matter? And why? And who is *really* maintaining this page? How many other dead people have MySpace pages? And what about the people who are posting comments on the dead guy’s page. An out pouring of guilt, anger, and sadness are infused in their messages. They miss him. They blame themselves for his suicide. They are processing their anger openly and outwardly on his MySpace page, knowing that he can’t read it and that other people do. And maybe that’s what the survivors of suicide need; a place to vent and to heal. At different points along the way I think we all wonder what it is that we leavve behind after we’re gone. In this case, I guess it’s a MySPace page where people can leave a comment. 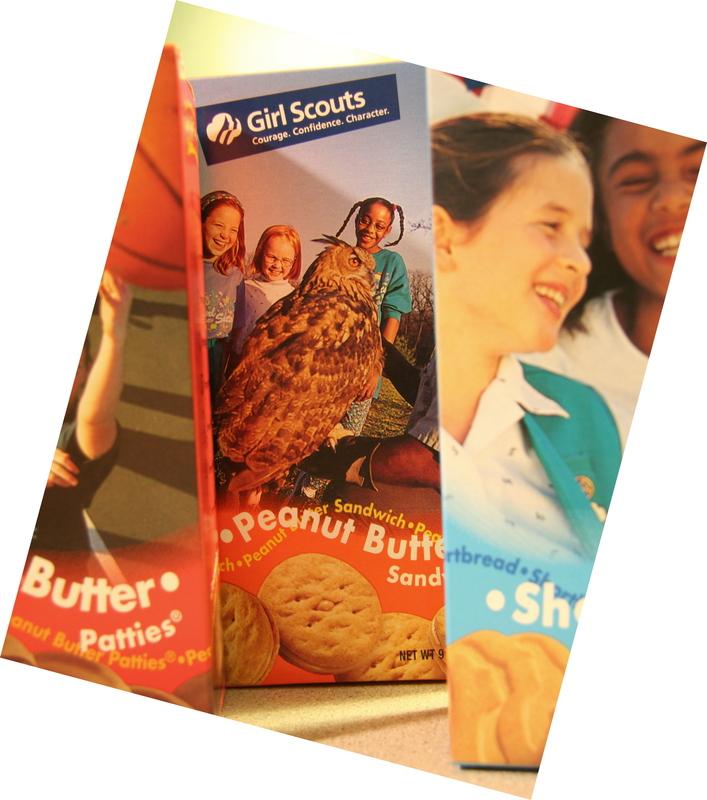 At $3.50 a box, Girl Scout cookies aren’t exactly a bargain. But then again, it’s really not about the cookies. Growing up, I was a Camp Fire Girl. It’s a similar organization to the Girl Scouts. Camp Fire Girls start as Bluebirds and then grow into Camp Fire Girls. We did projects and worked toward badges and beads. I remember going to conventions in the Fargo Civic Center where Camp Fire Girls would wear their vests with, what seemed like, hundreds of beads hanging off them. We went to Camp Fire Girls camp where we could ride horses, swim, sing around the camp fire, and sleep in bunks in cabins. Instead of selling cookies, the Camp Fire Girls sold candy. I remember the trepidation I felt having to ask someone to buy a box of candy. (I guess I knew sales wasn’t my cup of tea at an early age). One woman on our block, Mrs. Noble, was always willing and happy to buy a box of candy. And I was grateful she made it so easy to make the sale. Mrs. Noble died not too long ago. She was spunky, smart, and a wonderful friend to many. Now, it’s my turn. My to support a young girl in a young womans’ organization be able to earn badges, go to camp and to make the sale of Girl Scout Cookies easy. And if I have to eat a few cookies as a sacrifice, so be it. The temperature reached the upper 60’s today in Ann Arbor and the shedding of winter can be seen, not only in the bare brown grass on the ground, but in the introduction of all things spring: teenage girls in tank tops and shorts, more people on bicycles, motorcycle riders and orange construction barrels. The thump, thump, thump of the neighborhood boy’s basketball has been silent for months and it’s back again today, as are the chirps of birds. I haven’t seen a robin yet. That’s always been my signal that spring has arrive. Soon, though, I’m sure they will appear very soon. Above is this week’s PAW, a photo of my old saxophone. Enjoy. Served in a brew pub, three letters. Black and white twister, four letters. A few months ago I watched “Wordplay”, the documentary film about crossword puzzles and Will Shortz. It’s a great movie that, like the movie about spelling bees and Scrabble players, introduces you to some of the top world crossword puzzle solvers. Will Shortz is engaging and, as the puzzle editor of the New York Times, is a puzzle maniac. He’s got a degree in puzzles, something nobody else has, and is also NPR’s puzzle master. I’ve been downloading the podcast for almost a year and it’s a nice five minute treat among the other podcasts I listen to. At Malloy we print and bind books and not too long ago one of the publishers we serve printed a bunch of Sudoku books. I got sucked in. The Bindery Manager showed me the logic to those nine by nine puzzles and I was hooked. I’d sit for hours and listen to tv doing sudoku puzzles. I did them at breakfast. My friends and I played the Sudoku board game. Now, my attention has turned to crosswords. My grandmother was a big crossword puzzle solver. I remember she had special crossword puzzle dictionaries and reference books. It seemed really hard to me growing up. After seeing the movie and finding out that the puzzles were easier on Monday and got harder as the week went on, I tried the Monday puzzle in the Ann Arbor News. It took me a couple of days, working on it here and there, to get it. While I was on vacation in January I bought a whole book of Easy Monday Puzzles. They are pretty easy. I can get most of the puzzle in less than an hour (still quite a long time compared to the experts) and the ones I don’t get seem to be really off the wall clues or, I just get off on the wrong track. The other day there was a clue reading AAA supply. I got it in my head that it was a triple A battery and the answer was going to be something about supplying power. Instead, the answer was maps, for the complimentary maps the Automobile Automobile Association supplies. Once I get to the end of the Monday puzzle book maybe I’ll graduate to the Tuesday puzzle. I don’t have any crossword reference books … yet. The answers to the common easy Monday clues above? Ale. Pele. Estee. And, Oreo! I had a mammogram yesterday. The mobile Kamanos Mammogram Unit visits work every year. Malloy provides this valuable benefit to us and picks up the tab. It’s a great benefit on so many levels. It’s paid for, we’re still on the clock, it doesn’t eat into our preventative benefit and we skip the hassle of making an appointment and driving all the way to the hospital. There are two women who stock, set up, drive, and staff the mobile unit. The technician, Deb, and I got chatting about yoga. As she chattered on about her yoga experience (did it for a while and hasn’t done it lately), her meditation practice, and how she honors a different chakra each day by wearing matching jewelry and socks (all the same color, but different colors daily depending on the chakra), I was struck by how matter of fact and how normal/natural it all seemed. We could have been sitting at an outdoor cafe’, two friends chatting over coffee. Instead I was standing, naked from the waist up with her handling my breasts like a lump of clay. We all have different talents. Deb’s is making a potentially unnerving, uncomfortable situation like a chat at a coffee house. If you’re over 40, have a mammogram. Have one yearly. And I hope you find a technician as talented as Deb in the Karmanos Mobile Unit. You are currently browsing the Pam's Blog blog archives for March, 2007.